As a graduate student at Penn State, I had made it almost a requirement to read at least three or four Noam Chomsky books a year. 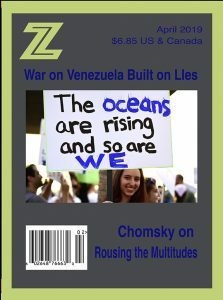 If you read enough Chomsky, you start wondering, “What is his outlook on my line of work?” Over the years I had been doing music interviews with bands, but I wanted to try a different sort of interview about the U.S government’s involvement with science and the arts. I met with Chomsky in mid-February at MIT. MIKSE: What is your perspective on science and its role in the development of human progress and the human mind? CHOMSKY: It’s right at the core. If you mean professional science, for a long time it didn’t make much of a direct contribution in getting things done. The point at which true science began to really influence practice is pretty recent. Take MIT. When I got here almost 60 years ago, it was an engineering school. People learned how to make things—build a bridge, make an electrical circuit. It was mostly craft. You learned things the way a good carpenter learns things. There were science courses and math courses, but they were pretty much service courses, techniques for engineers. Within 20 years, if you wanted to build things or make things, you didn’t go to MIT, you went to Northeastern or Wentworth Institute or some place like that. This has become a science university. The reason was because of the change that took place. Science had something to say to the practical arts and there was a huge explosion of technology: computers, software, IT, satellites, microelectronics. A lot of these massive changes came out of fundamental science. Furthermore, technology started to change much faster. If you wanted to train engineers of the future, there’s not much point training them in the technology of today. It’s going to be much different 20 years from now, so you study fundamental science. The same thing took place in medicine. Until, say, a century ago, there was a real question studied by the historians of medicine. If you went to a doctor, your chances of improvement would be no better than 50 percent because it’s mostly intuition and craft. I remember doctors in my childhood who would do things such as leeches, which was supposed to bring out the blood. That changed a lot with the development of the first sulfur drugs, antibiotics, and so on—and also advanced surgical techniques. But these were all consequences of the contributions of real science, such as biology, to the practice of medicine. It’s not the first time. Like the early industrial revolution, the physical principals are not the most sophisticated ones. By now, not only the world, but the survival of the species depends on sophisticated science. We’re not going to get out of the environmental crisis unless there are significant scientific innovations, figuring out some way to harness solar power. That’s not going to happen by itself. Unfortunately, a lot of science tradition throughout the years has been going into developing better means of destruction. The early agricultural revolution 10,000 years ago was based on the science of the day; that is, figuring out how to grow crops more effectively. It was pretty sophisticated. One of the things that’s been discovered that surprised contemporary scientists and anthropologists is that, quite commonly when the West goes into some cultures like Liberia and proposes scientific agriculture, its yields decline. What’s happened is that there’s a tremendous amount of technical lore that isn’t written down and is usually passed from mother to daughter. Agriculture was usually women’s work, but very complex lore—you should plant this seed under this rock because the sun hits it at a certain hour and so on and so forth. That lore wasn’t known by most men in the community, let alone anyone else. When scientific agriculture comes in, it destroys it and brings in Western concepts of agriculture: high use of fertilizer, other inputs, to deal with a decline in yields. So science isn’t simply what we do in an MIT laboratory. What is the general public’s outlook on science and the arts? Do they consider it a worthwhile part of their education? Is it even possible to measure? You can take polls, but they give you strange results. The United States is a strange country. It’s off the spectrum on many of these issues. I don’t think there’s any other industrial country or part of the modern world where you get half the population thinking the world was created 10,000 years ago. That’s a pretty unique U.S. phenomenon. It’s not just talk radio. You can read it in the front page of the New York Times. There was an article a couple of days ago asking if global warming is science or snake oil? They presented two views to balance it. One was the view of 99 percent of people who know anything about the topic. The other was the view of Senator James Inhofe who says it’s all fake and a couple others, or maybe Rush Limbaugh. Those are the two views. You don’t say that about the flat earth hypothesis or did the holocaust happen? You don’t balance two views like that. To get back to your question, if you look at popular attitudes, they’re dangerous and they’re affected very significantly by massive propaganda. If you want to get to the core of irrationality, the deepest level has to be market systems. In a market system—we have only a partial market system—but markets have inherent what they call “inefficiencies,” really lethal inefficiencies. We’re living through one right now: the financial crisis. It’s an inherent part of markets that if you make a transaction, then you look out for yourself not other people. That’s called in economics an externality. If you’re, say, a Goldman Sachs executive and you make a loan or investment or something, if you’re functioning “properly” you cover your own risk. But you don’t cover what’s called systemic risk—the risk to society and the system in general. When you look at most of the business world—particularly the energy corporations, but also the business world in general—for them the survival of the species is an externality. When you’re making decisions you cannot take that into account. They’re legally obligated not to take it into account. If you’re a CEO of a corporation you are legally obligated to maximize profit and market share, not to pay attention to consequences. If you did you’d be out of a job because someone else would come in who is interested in profit. That’s inherent to markets. You can find ways to counter them with large-scale regulation and other stuff, but in a market system what you have is the business community committed to destroying everything they own and making it impossible for their grandchildren to survive. It’s not that they’re bad people. If you ask them, do they care about their grandchildren, they say sure, they’d do anything for them. Meanwhile, in their institutions, they have to disregard it. So there’s massive business propaganda trying to convince people that humans have no effect on global warming because that doesn’t increase short-term profit. If they knock down energy legislation, they’ll do better in the next quarter. Those are very profound irrationalities. One of the consequences is that there’s a very destructive belief system. In your book Failed States, one of the points you bring up is how government policy is very frequently the opposite of what people want. Is it the same when it comes to science, research, and the arts? The way public opinion is portrayed is incredibly misleading. For example, take welfare state policies, social policies, aid for the poor, Social Security. What you read in the headlines is that the public is against them. If you take a look at social attitudes, they’re entirely different. Even among people who identify themselves in polls, there’s still considerable majorities and support for education and health, the government, for the poor and so on. There are only two exceptions that are striking. One exception is blacks. People who call themselves conservative or “anti-government” think we’re giving too much to blacks. Take a look at the black population: it’s a deep depression for them right now. But we’re giving too much away to them. That’s an example of old-fashioned American racism. You get the same answer to foreign aid. A large majority say we give too much away to those “undeserving” people out there. Then when you ask the same people what they think foreign aid should be, it turns out it’s far higher than what it actually is. You have to be really careful in studying what attitudes really are. Another thing that’s surprising is that a considerable majority thinks the U.S. shouldn’t take the lead in international crises. It should rely on the United Nations. In fact, the majority of the population thinks we should give up the veto in the Security Council. Take Iran. I don’t know what the attitudes are now because there’s been a tremendous propaganda campaign over the last two years. But two years ago, a very large majority of the population thought Iran should have the right to enrich uranium as a signer of the non-proliferation treaty, but of course not have nuclear weapons. Over time this propaganda does change attitudes, though. If the polls were taken now, they’d say that Iran is a major threat. So, propaganda works. But still there’s a substantial split between public attitudes and public policies. Same on health care. If you read the headlines, they tell you that the public is turning against Obama’s health-care program, which is true. They say it’s because we want to get the government off our backs. But you take a look at the polls that those headlines are based on and they show that you have people against it because it doesn’t go far enough, that they gave everything away, like the public option, the Medicare buy-in, and so on. A strong focus of the previous and current Administration is on safety of the public. As such, money is being cut from science and the National Institute of Health and shifted more towards militarization…. If I may interrupt, the safety of the public is a low priority for governments. In the Bush administration, for example, terror was quite a low priority and it’s very clear. Take invading Iraq. The invasion of Iraq was undertaken with the assumption that it would increase terror and, in fact, it did, significantly. Their data showed that it went up a factor of seven the year after the invasion. Take after 9/11. If there had been any concern for reducing terror, there was a policy that could have been pursued. The jihadi movement is a big movement and it bitterly condemned al-Qaida. It condemned the 9/11 attacks as non-Islamic. There were also sharp condemnations from universities and from radical clerics. Suppose you were interested in reducing terror, what could have been done was to exploit the fact that the jihadi movement, let alone the general population, was appalled by this. You try to isolate al-Qaida and break them off from their constituencies and supporters. Instead, the government decided to do the opposite. It decided to weld the jihadi movement back together and create massive new recruiting for al-Qaida. That’s what the invasions of Afghanistan and Iraq did. Would it be more precise to say that funding has been cut from the NIH and shifted more towards militarization? Under the Bush administration, there were significant cuts. It was a very anti-science administration. But let’s take Obama, who’s supposed to be progressive. You read every day about the deficit. The headlines are concerned that the debt’s been misplaced. In fact, if you want to reduce the deficit, most economists will tell you—even conservative economists—the way to do it is to spend more government money. With a bigger stimulus it will get people back to working. That will increase economic growth, it will increase taxes. It’s pretty much the consensus among economists and it’s pretty straightforward. Let’s take a look at the deficit. Where is it coming from? Almost half of next year’s deficit is coming from the military budget. Obama has submitted the biggest military budget of any president since World War II. And it’s close to half the deficit. Are they talking about reducing the military budget? No. What they’re talking about is reducing Social Security, services for the population. If you’re an executive in the business roundtable, or business lobbies, it’s just what you want. Their power is extraordinary. One of the issues that was discussed in the movie The Corporationis that the genetic code is slowly being owned by corporations as they copyright different genes for their profit. What do you think the ethical merits are of this and is the idea of life at risk of being property? Sure, and it’s not just there. One of the main issues of the World Trade Organization was called “trade and services.” What are services? “Services” are usually anything a person cares about, like education, health, environment. So what are trade and services? Well, to the WTO, et al., They mean that anything people care about is put into the hands of unaccountable private tyrannies. That’s a tremendous attack on democracy. It means you can have formal democratic institutions, but there’s nothing for them to do because everything is in the in the hands of private tyrannies—corporations. Switching topics a little bit, Harold Varmus and other intellectuals have been appointed as chairs of the Presidential Counsel of Advisors for Science and Technology for the Obama administration. What role does this counsel essentially play and have they influenced legislation in the past at all? Take a look at modern science and technology, like computers, the Internet, satellites, lasers, buying things at Wal-Mart—which comes from trade which comes from containers. Anywhere you look, you’ll find major contributions of the state sector to the advanced economy. That came from scientists in the early post-war period who persuaded the government to pour a lot of money into developing fundamental science. You could argue that maybe it’s right, maybe it’s wrong, but what was interesting about it was that it was done in a way that demonstrated their fear and hatred of democracy. They didn’t come to the public and say, “Look, you guys should pay more taxes so maybe your grandchildren will have a PC.” What they said was, “The Russians are coming and we’ve got to defend ourselves so we need a huge military budget.” You can see it at MIT. This is one of the main places where it happened. In the 1950s and 1960s, MIT was maybe 90 percent funded by the Pentagon. But it wasn’t doing military work, it was developing the advanced economy of the future. If you look at the years since, Pentagon funding has declined. It hasn’t disappeared, but it’s declined and funding from the National Institute of Health and health-related funding has gone up. Why? Because the cutting edge of the economy of the future is biology-based, not electronic based. So the public is being ripped off in a different fashion. Take a walk around the area near MIT. What you see are startup firms in genetic engineering, bioengineering, biotechnology, and the big guys like Novartis who feed off the public trough. They want the public to pay the cost of research and development while they get the benefits. If you look back 50 years ago, what you found were small startup and electronic firms feeding off of funded technology. That’s the way the economy works, but it was initiated by far-sighted scientists and I suppose the advisors today are doing the same thing. They have an interest in science—a lot of them are real scientists and want serious scientific work going on—but they’ve got to have the same concerns as Obama. If the investment community doesn’t like what you’re doing, you’re out of business because they’re the guys who own and dictate policy, so you’ve got to have an eye on that. Is that one of reasons why recently in England David Nutt, who was the government advisor on drugs and marijuana, was fired? Because he didn’t agree with government policy? It certainly looked like that. Actually, the marijuana case is very interesting. Why is marijuana criminalized? It’s comparably less dangerous than alcohol and massively less dangerous than tobacco. If you look at deaths from substances, way out in the lead is tobacco with millions of deaths all over the place. Tobacco not only harms the user, it harms everyone else, so deaths from passive smoking and being around people who smoke are way higher than deaths from hard drugs. The next most lethal substance is alcohol in terms of deaths, but also alcohol harms other people. Alcohol makes people violent. A lot of domestic abuses are from alcohol. Drunk driving kills people. So, alcohol is not only extremely harmful for the user, but for everyone else, too. But it’s not criminalized. When you get down to marijuana, it’s probably not good for you, but coffee is not good for you either. I don’t think there’s been a single overdose of marijuana recorded in how many millions of users, but that’s the one that’s criminalized. The reasons for it go back to racism. Look at the history of marijuana criminalization. It started early in the last century—Mexicans were using it. Most prohibitions have been geared towards the “dangerous classes,” poor working people and so on. When prohibition ended, there was a big government bureaucracy left and they had to have something to do, so they started to call Senate hearings on marijuana. The American Medical Association testified and said there’s nothing wrong with it, but they were disregarded. There were a few scare stories that it makes people insane and makes people criminals, so then comes the big marijuana scare. In 1971—there have been studies of this—not only the government, but the whole elite sector from right to left had two big problems. One was that young people were getting out of control; they weren’t disciplined. There were studies from the liberal sector saying we have to do something about these institutions responsible for the indoctrination of the young. They’re not doing their job. Kids are thinking too much, they’re too free, they’re out of control, so there was a “law and order” campaign. There was another problem. By around 1970, criticism of the Vietnam War was getting beyond legitimate bounds. For liberal educated America, you cannot say the United States did anything wrong. Maybe some individuals did, but they can’t do anything wrong by definition. The U.S. can make mistakes, but they can’t be criminals. That’s a deep element of the intellectual culture across the spectrum. In 1971, a lot of people were saying the war was criminal. A majority of the American population was saying the war was fundamentally wrong and immoral, not a mistake, and that’s dangerous. So you have to do something about that. They had to turn us into the victims and that was done by concocting the myth of an addicted army. If you listened to Walter Cronkite, he would say that the “commies” are not only attacking our boys with rifles, they’re attacking them with drugs. They’re going to come back and start a criminal rampage in the country and they’re going to destroy us. That was across the spectrum. Actually, there are studies and it turns out that drug addiction among soldiers was kind of at the level of the youth culture—pretty much what you’d expect. There was addiction, it was alcohol, but that’s not considered addiction. So what you have is this mythology that was used by the law and order side as the reason the youth were going crazy, and they won’t listen to us because they’re all high on pot. So you declare a war on drugs. And it worked. By 1977, Jimmy Carter was able to give a press conference in which he was asked, “Do we owe anything to the Vietnamese?” He answered by saying no we don’t because the destruction was mutual. Around the same time the economy was being financialized. There was a reduction of productive industry, which means no jobs for working class people who happened to be black, so you have to do something with the superfluous population. What are you going to do with them? Toss them in jail. It was around that time—from Reagan until now—that the incarceration rate went from the norm for industrial countries to way beyond any country that has statistics. Look who’s there. A very high percentage are blacks and now Hispanics who are there on drug charges. So it was a way to get rid of the superfluous population. It was a way of turning us into the good guys in Vietnam. It was a way of imposing law and order. And abroad it’s just a cover for counterinsurgency. You want to, say, carry out chemical warfare in Colombia to clear the land for multinationals to drive the population away? You call it a drug war. It’s quite interesting because study after study shows that the drug war has no effect on drug use or even drug prices. The price of cocaine in New York stayed about the same, despite the huge amount of money that went into it. Why do you think that in this modern time when science is more embraced than it’s ever been, people still cling onto the idea of intelligent design regardless of the evidence present for evolution. Do you think it’s scientists failing to communicate the idea efficiently? It’s partly that. But remember, it’s mostly a U.S. phenomenon. In part it’s due to strains in the culture that go back to the early colonists. Remember this country was settled by religious fanatics. Take a look at the colonists who came over from England. There’s a streak of providentialism, meaning carrying out God’s will, which is very strong in American culture, including the leading figures. There was an article last year in Seed magazine called “The Essential Parallel between Science and Democracy” and it talks about U.S. policy favoring an alliance between science and business. Do you feel that an alliance like this is ideal if we are to expect the maximum benefits of the scientific community? Let’s take everything we talked about. Do you use a computer? That’s science contributing to business. Is it a good thing to do? Maybe, but if you go back to the 1950s, suppose people were given a choice, an honest choice, “Look, do you want your grandchildren to have an iPod or do you want better health and education?” Maybe they would have said, “I want my grandson to have an iPod.” But they weren’t given that choice. These are real decisions that have to be made. Should we have solar energy? Yeah, I think we should. Should it be an honest choice among the population or should it be overwhelmed by business propaganda, which says it’s all a liberal farce? But there’s no general comment to make about science and the public good. I mean it all depends on social and economic conditions, on power relations, on commitment to democracy. Ollie Mikse is a graduate student at the Penn State Hershey Medical Center and a freelance journalist for Punknews. org, Ground Control Magazine, Ghetto Blaster, and, on occasion, Razorcake. My thanks go to Lydia Sargent, Bev Stohl, Emily Yoder, and Liz Laribee for making this interview happen.